What Weather Should You Expect on your Peru Holiday? 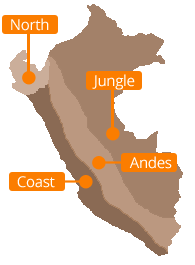 The four major climate regions in Peru are the Southern & Central Coast, the Equatorial North, the Amazon Jungle and the Andes Mountains. On the coast and in the north, the weather really depends on whether it's winter or summer, but in the Andes and the Amazon the difference between the dry and rainy seasons can be more important. In November through to around April, Peru's southern and central coast is bathed in sunshine, making it a great time for the beach at the Paracas pensinsula. However, from May to October, the whole coast from around Trujillo southwards is covered with a misty haze known as garua, which really keeps temperatures quite low. The main thing in the Andes is to avoid the rainy season, which runs from November to March. Although this is the Peruvian summer, so it's not cold, the rain can be quite heavy and you won't see much sun. Most people visit from April to October when the skies are clear, but the downside is that the nights can be very cold - getting down to freezing at night in Cusco and Lake Titicaca, although less extreme further north in places like Chachapoyas and Cajamarca. In Peru's Amazon rainforest, the temperature doesn't fluctuate a great deal throughout the year, so the main factor to bear in mind is the rainfall. Actually times of high rainfall make river navigation easier, but for a good balance we'd suggest April/May as a time when you won't have too much rain but you can still get to some of the hard-to-reach places.